I'm going to be totally honest here... have you ever hidden from your kids? I don't mean while playing 'hide and seek' but hidden away to get a moments peace? I have heard of mums who sometimes hide out in the toilet... I've done that before, but then we lived in a house and had a curtain as the toilet door for 2 years (don't ask me to tell you what that was like!). Don't get me wrong, I love my kids to bits, but sometimes I need a bit of space to think... breathe... pray... and usually if I shut myself somewhere there is this immense need for kids to know what is going on behind that closed door. I've discovered the perfect place though - and I hope they don't discover it for a while. 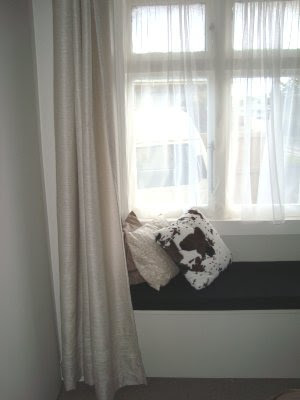 In our bedroom hubby has built a bench seat into the window cavity and the bedroom curtains close in front of this bench seat. 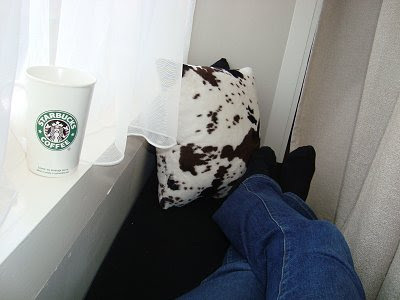 I was innocently sitting there the other day (drinking out of my most favourite mug at the moment) when I heard the noise of my lovely kids coming, and I had this sudden desire to hide and enjoy the peace for just a moment longer... so I shut the curtains and no one found me. The perfect hiding place... for now. Great space! I often retreat to my room and just lie on my bed.... sometimes I'll get 10-15 good minutes before they'll realize I've disappeared! I'm going to be totally honest here... have you ever hidden from your wife when she wants you to change your toddler's pooey nappy? That's a perfect spot - I just hope the kids don't read the blog! Make the most of it while it lasts .